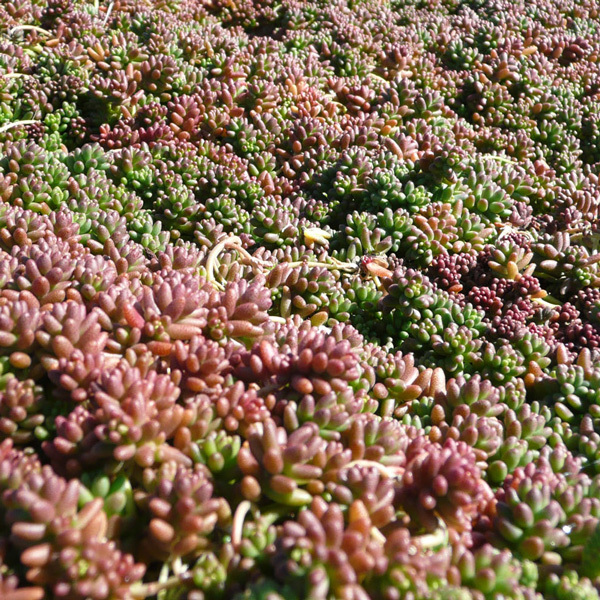 This selection is an excellent groundcover plant, particularly for hot, dry sites. It forms a low carpet of small, rounded green leaves that are clustered together like little beads, taking on rich red tones in summer and winter. White star flowers appear in summer. Nice in a rock garden, but keep this fast grower away from slower alpine plants that it might smother. Grows well in containers. Easy to propagate; simply break pieces off before they begin to flower and stick them in the ground. Good winter effect. Useful for planting in green roofs or in rock walls. Short enough to use between flagstones in a patio or walkway.